In an effort to help residents enjoy a safe 4th of July, the Oak Hill Fire Department makes the following suggestions for dealing with the anticipated heat, dangerous fire weather conditions, and fireworks. The statement can be found HERE. September 2, 2009 – Westlake and Oak Hill Fire Department Assistant Fire Chief J.J. Wittig received his professional designation as a Chief Fire Officer from the Center for Public Safety Excellence on August 27, 2009. 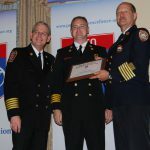 Chief Wittig was honored at a banquet hosted in conjunction with the International Association of Fire Chief’s conference in Dallas, Texas with other Chief Officers from around the nation to receive the prestigious designation of Chief Fire Officer. Assistant Fire Chief J.J. Wittig (center) receives CFO designation, pictured above with representatives from CPSE. As a first time designee, Chief Wittig submitted his professional credentials in the stringent peer review process designed to offer guidance for career planning and development as well as recognizing lifelong career excellence and achievement. The designation of Chief Fire Officer demonstrates that an individual has developed a strategy for continued career improvement, development, and enhancement to the services their department provides. The Center for Public Safety Excellence, Inc. (CPSE) establishes and promotes recognized professional standards to help fire agencies move beyond tactical deployment to continuous strategic improvement. CPSE supports and encourages agencies and personnel to meet these standards through various programs and the work of two commissions, the Commission on Fire Accreditation International and the Commission on Professional Credentialing. Chief Wittig joins 658 Chief Officers nationwide and is now one of only 31 in the State of Texas designated as a Chief Fire Officer. Chief Gary Warren, Chief of the Westlake and Oak Hill Fire Departments, recently remodeled his home to include a fire sprinkler retrofit. Knowing firsthand the importance of this life-saving feature, Chief Warren also wanted to understand what it would take to install residential fire sprinklers in an existing home. Having introduced a sprinkler ordinance to the Austin City Council in 2001, Chief Warren has always been a strong advocate for home fire sprinklers. With this project, Chief Warren hopes to increase awareness for current homeowners and individuals involved in new construction by producing a video of the entire installation of the system and providing that to anyone who is interested in sprinklers. Want to know what the department did last year? View the 2010 Annual Report. Oak Hill and Westlake Fire Departments joined together on January 17th for their annual awards banquet. Certificates and awards were given to members of the department who made an impact on the community or the department over the last year. With over 150 members in attendance, awards ranging from Firefighter of the Year to Unit Citations for Valorous Conduct were given to recipients. Members demonstrating outstanding achievement during the year received the Firefighter Achievement Award. Captain Jim Key, not pictured, was also a recipient. Two OHFD members received the Unit Citation / Valorous Conduct award for responding to the call for assistance with evacuation during Hurricane Ike, staffing buses and providing medical assistance: Captain Scott Barfield and Firefighter Scott Fiebig. Oak Hill’s Captain Jim Key received the Loy I. Mackey Award, which recognizes the volunteer who unselfishly gives an excess amount of time and talents in support of the Oak Hill Fire Department. Captain Key received the award for representing honesty, reliability, and credibility to all who know him. He has taught and mentored many firefighters and officers during his time with the Department. The Federal Emergency Management Agency has awarded the Oak Hill Fire Department $60,800 for a firefighter training simulator. The grant will fund the purchase of a Mobile Flashover Training Simulator, a “live fire” training exercise designed to teach proper response in the moments before the “flashover” point where a lethal spontaneous combustion occurs. The simulator mimics the heat and flame conditions just prior to flashover, so that firefighters can learn to recognize the warning signs and either prevent the fire from spreading or evacuate safely. Training simulation using a flashover trainer. The flashover training trailer brings the opportunity to conduct live-fire training to any of the Travis County Fire Departments. This particular device can be set up at any location where a department might want to train which will allow for more training with less down time for on-duty firefighters.